Kick start your 2018 healthy eating plans by adding more cruciferous vegetables to your eating style. 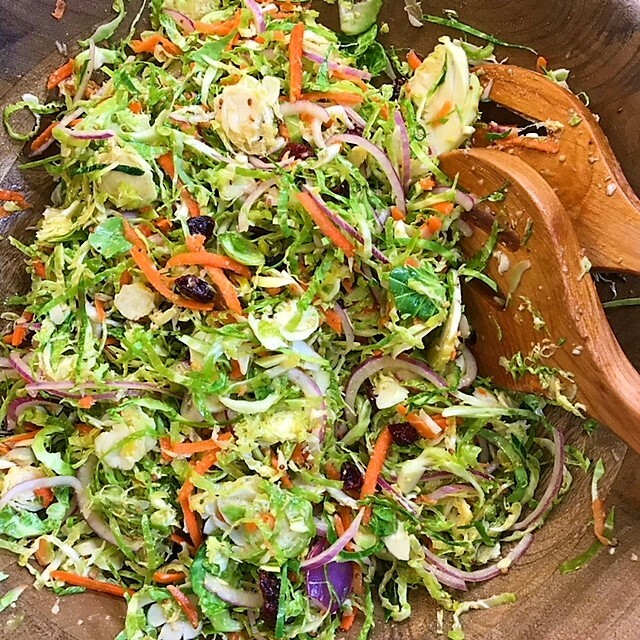 This upscale Slaw recipe is easy to make, fabulous to eat, and is loaded with good for you vegetables. According to the American Institute for Cancer Research, several components in the cruciferous family of vegetables have been linked to a reduction in cancer risk. Other cruciferous vegetables include: broccoli, cabbage, kale, cauliflower, collard greens, rutabaga, turnips, watercress, arugula and bok choy. Try the Slaw recipe below and watch the video from My Left Frying Pan on how to make it. Recipe created by: Amy Whitson PHEc. In a large bowl make the dressing: whisk together vinegar, maple syrup, mustard, horseradish, salt and pepper. Whisk in the oil until smooth. Set aside. Use the grating attachment on a food processor or a box grater to shred the sprouts, radishes and carrot. Transfer to the bowl. Add the onions and cranberries (if using) and toss well to coat. Let the salad stand for 15 minutes to meld flavours. Taste and adjust seasonings as needed. Serve.